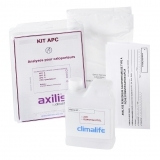 APC KIT:- Periodic Heat Transfer Analysis and interpretation of results by the Climalife laboratory. The APC Kit is used for periodic control analysis of climatic circuits, to allow for preventative maintenance. The APC kit is made up of an identification form and a 500 ml flask for sampling on-site. APC A = Appearance + freezing point of glycol or 1,3-propanediol based products. APC B = APC A + density at 20°C + reserve alkalinity (deterioration evaluation) + pH for glycol or 1,3-propanediol based products. APC D = APC B + GPC* quantiglycol test for glycol based products only. FRIOGEL® NEO; a concentrated antifreeze based on Mono Propylene Glycol and corrosion inhibitors, is a heat transfer fluid for low temperature refrigeration systems and food industry. NEUTRAGEL® NEO, is a concentrated antifreeze based on Mono Ethylene Glycol and corrosion inhibitors. It is a heat transfer fluid designed for refrigeration installations working at low temperatures and for central heating systems. It is however not authorized for use in single exchange domestic water production systems. NEUTRAGUARD® NEO, with a Mono Propylene Glycol base and corrosion inhibitors, is a concentrated anti-freeze heat transfer fluid used in the circulation of central heating, solar thermal, underfloor heating and geothermal. SOLUFLUID® is a READY-TO-USE heat transfer fluid based on MONOPROPYLENE GLYCOL and corrosion inhibitors. SOLUFLUID® HEAT PUMP is a READY-TO-USE heat transfer fluid based on MONOPROPYLENE GLYCOL and corrosion inhibitors. It is suitable for ground source geothermal (buried collector circuits) and aerothermal Air to Water heat pump systems. SOLUFLUID® SOLAR is a READY TO USE heat transfer fluid based on MONOPROPYLENE GLYCOL and corrosion inhibitors. It is designed for sanitary hot water production circuits in solar panels or vacuum tubes.